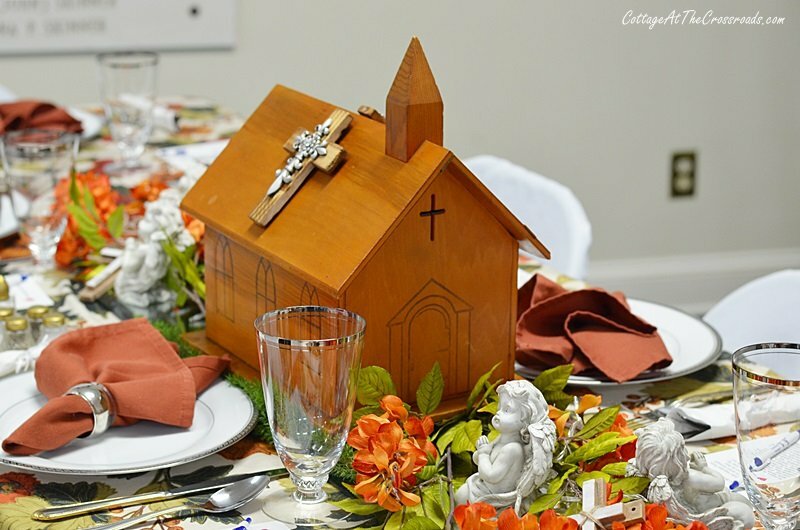 In this post you will find lots of tablesetting ideas for any holiday from our most recent tablescape fundraiser at our church. Hello everyone! 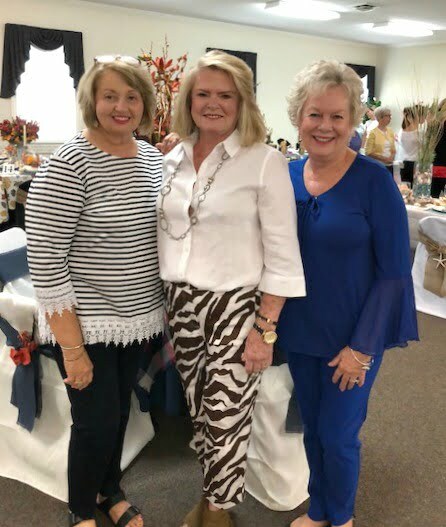 I have been as busy as a beaver preparing for our church’s 2018 tablescape fundraiser which was held this past Saturday at Lamar United Methodist Church. This is the 2nd time we’ve had this type of fundraiser and you may remember me posting about our first one two years ago. 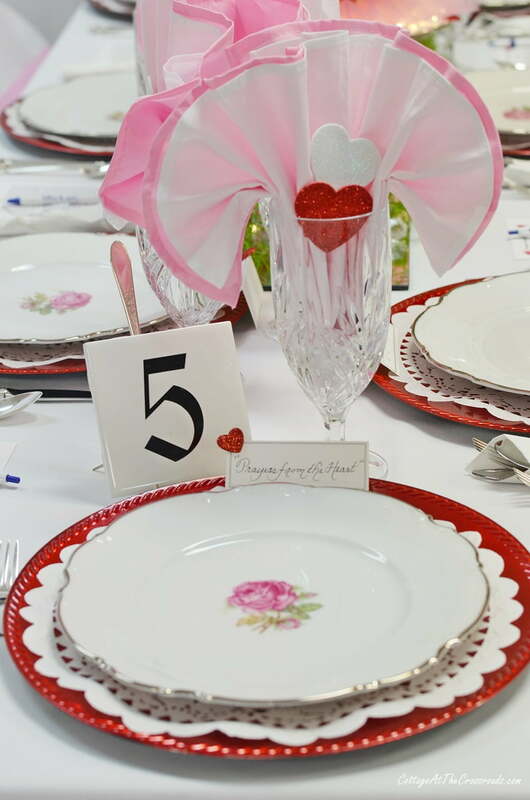 The fundraiser is composed of a sit down luncheon at beautifully decorated tables, a speaker and entertainment, and a silent auction. 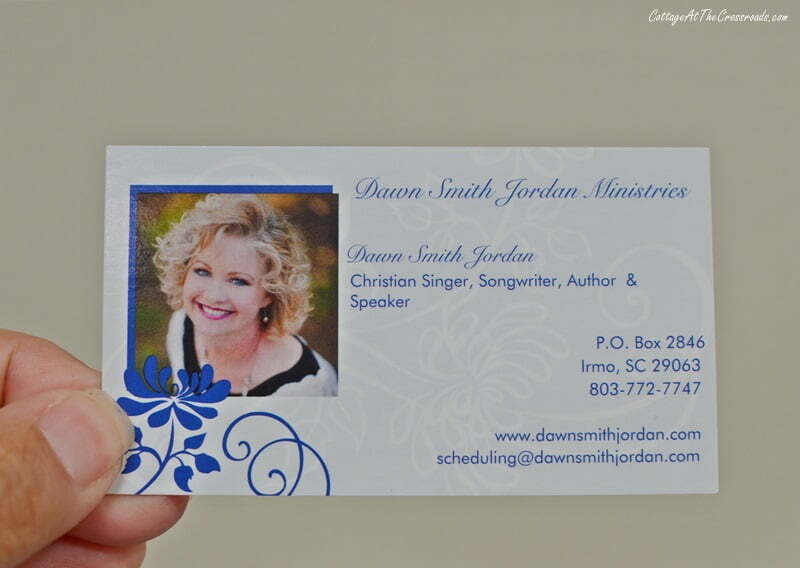 Our speaker this year was Dawn Smith Jordan: singer, songwriter, author, and a former Miss South Carolina. She had us laughing and crying for an entire hour, and we all left richly blessed by her message. If you have any sort of similar event, I highly recommend her as a speaker. 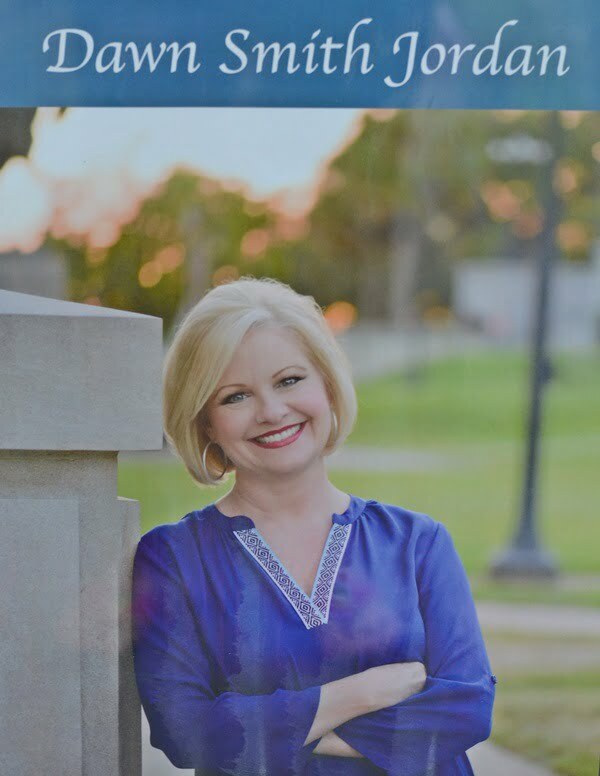 I’ve included her contact info in case you are interested or you can visit her website for more information. Each person wrote a prayer request on the back and the cards were randomly placed in the gift bags and given out at the end of the luncheon. 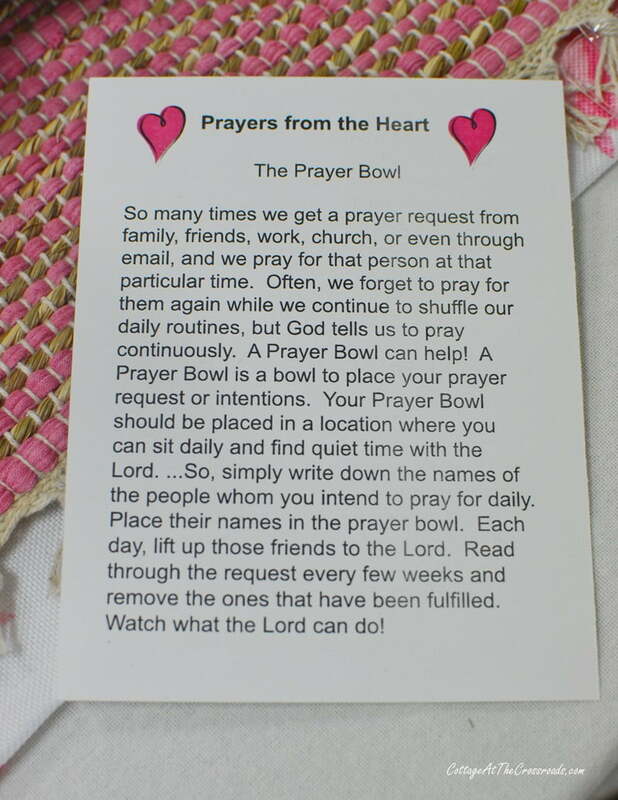 Isn’t the idea of a prayer bowl a good one? Today I thought I’d share with you some of the beautifully decorated tables. There were a total of 16 tables and a guest table so I will be breaking this down into two posts. 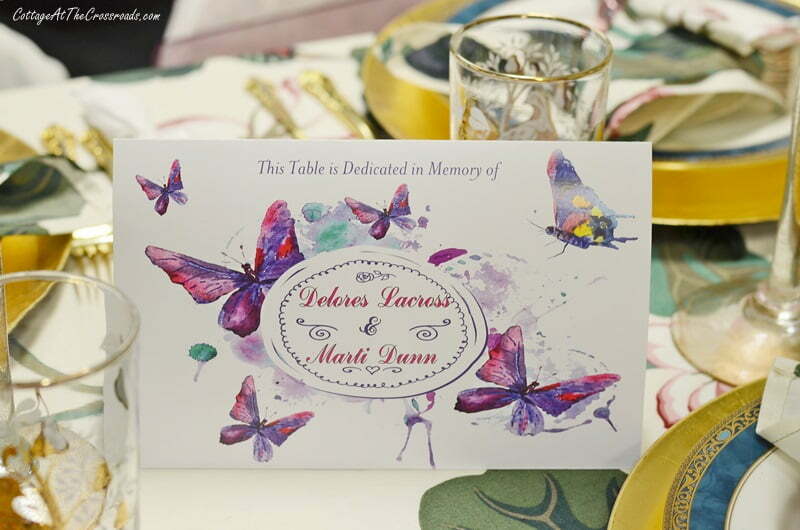 And since I had so many of you asking about how to go about having a tablescape fundraiser, I thought I’d do an additional post with some guidelines. All I can say, though, is that this event would not have been possible without many countless hours of work on the part of many, many people from our church. The food, the gift bags, the tables, the silent auction items, and the speaker were all extraordinary! Let’s start in numerical order with table 1. 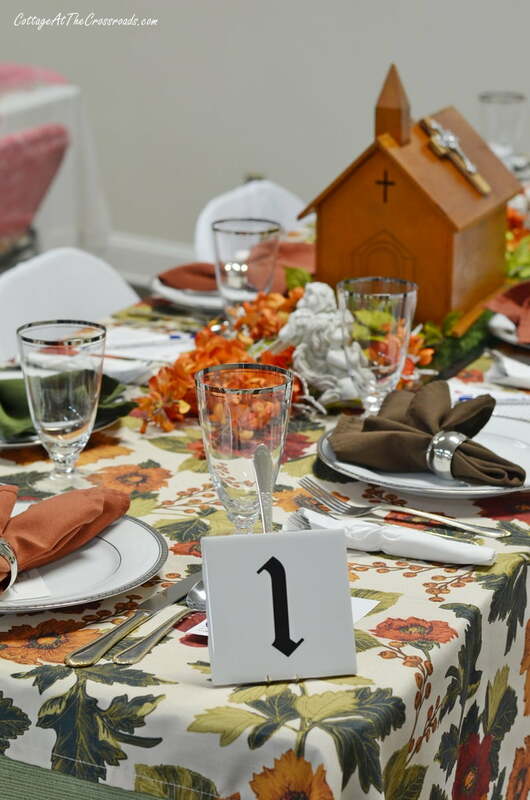 Table number 1 was done in beautiful autumnal colors of green, brown, and orange. The chair covers that were decorated with hydrangeas in the most beautiful shade of orange perfectly complimented the table decor. The centerpiece was composed of this beautiful handmade church along with angels and crosses. 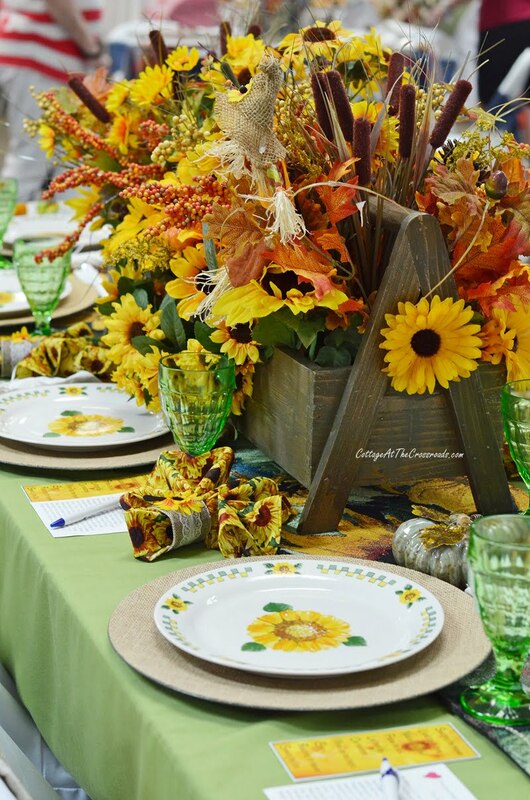 I love to get the story or history of items used in these tablescapes. This church belonged to one of the ladies whose father had made it for the church she attended in childhood. It served as an offertory collection for the Epworth Children’s Home which is still a mission of the United Methodist Church. 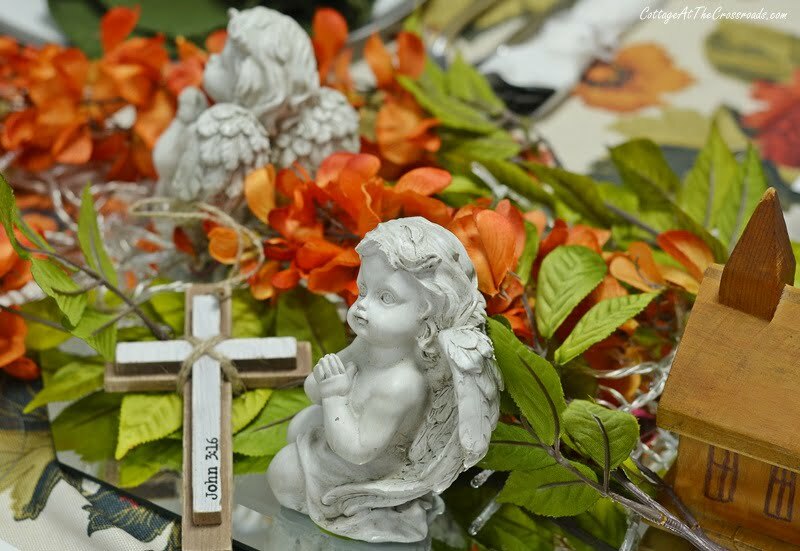 Sweet angels and several different handmade crosses completed the theme for this table. Table 2 had a flamingo theme and was completed by myself and my two sisters-in-law. We had the most fun putting together this table along with another one that I’ll show you in part 2. 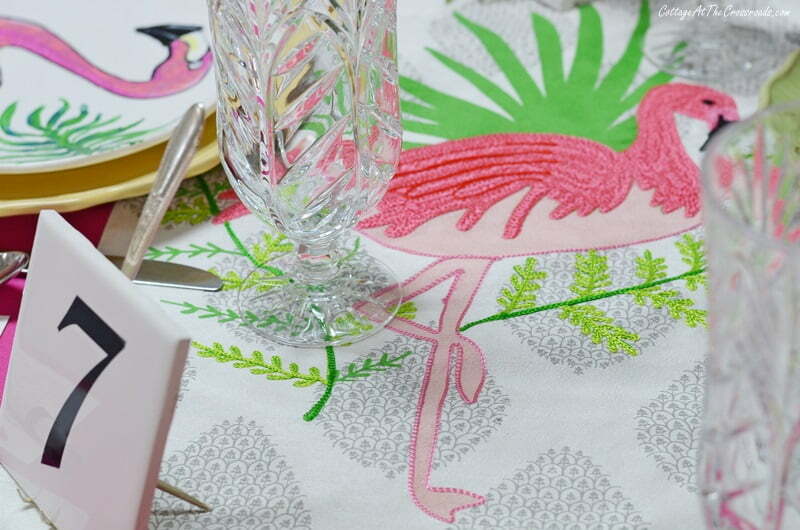 The inspiration for the table came from a flamingo tablecloth that we spotted at HomeGoods back in the summer. 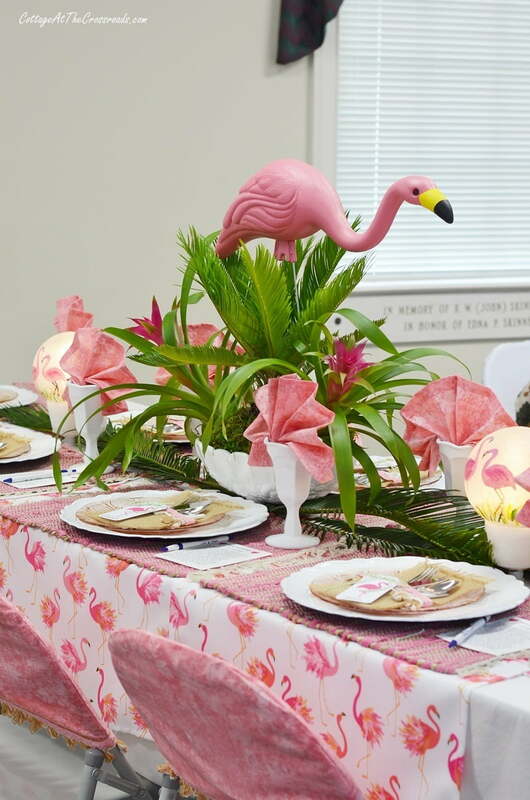 Of course, we couldn’t resist sticking a plastic yard flamingo in the centerpiece! 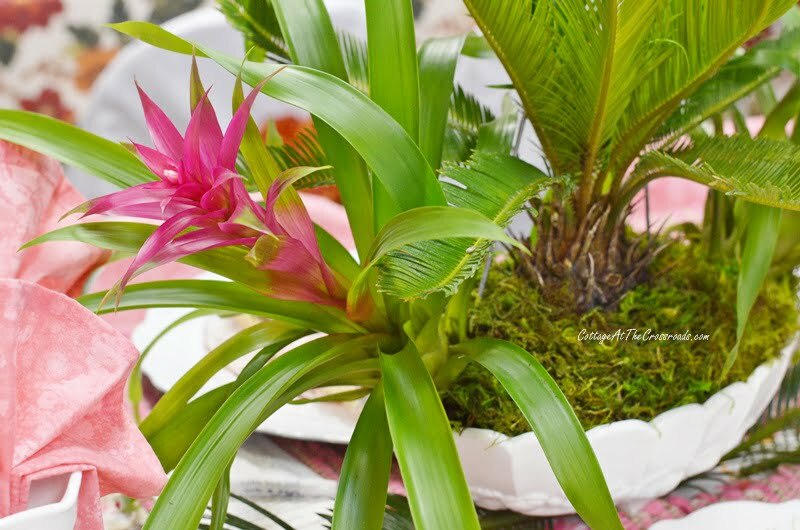 Two bromeliads and a sego palm were planted in a milk glass footed bowl to make the centerpiece. 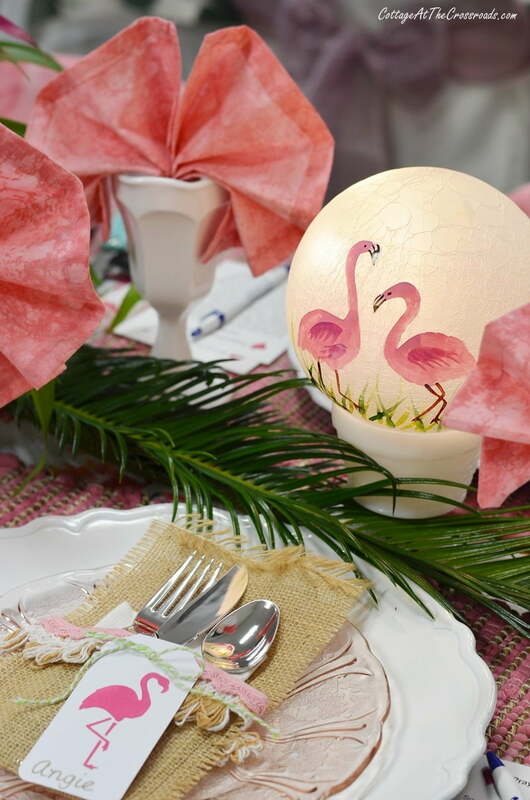 Milk glass containers held the lighted flamingo decorated globes, and we also used milk glass stemware. I do want to point out that we don’t actually eat on the china at each place setting. Food is served on plastic plates and we use plastic flatware and glasses. 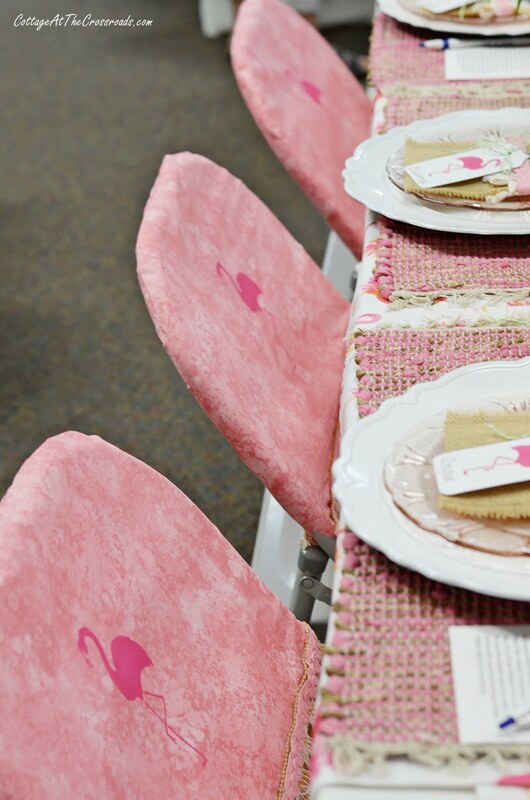 Flamingo stenciled chair covers completed the whole look for the table. 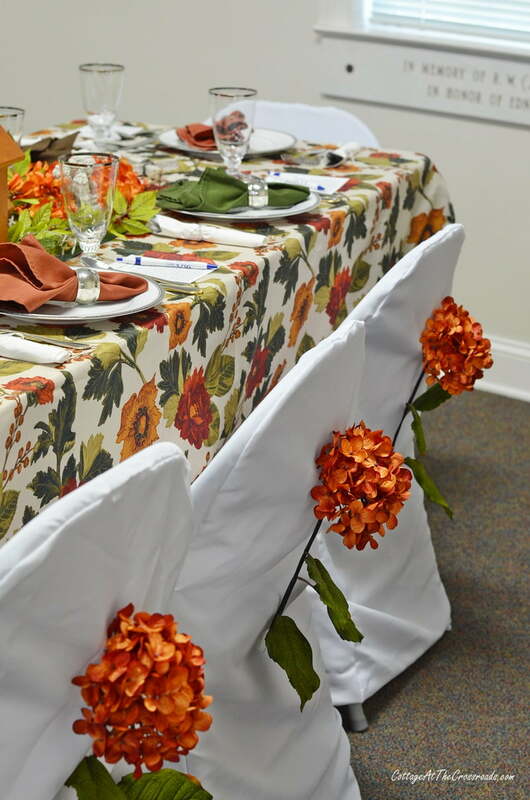 Table 3 had a beautiful floral scheme and also served as a memorial table for two of our beloved Methodist ladies members that we lost recently. 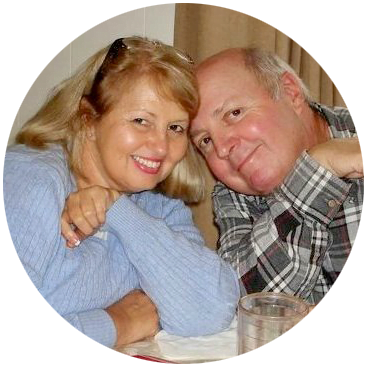 Their impact on our church and our lives will never be forgotten. 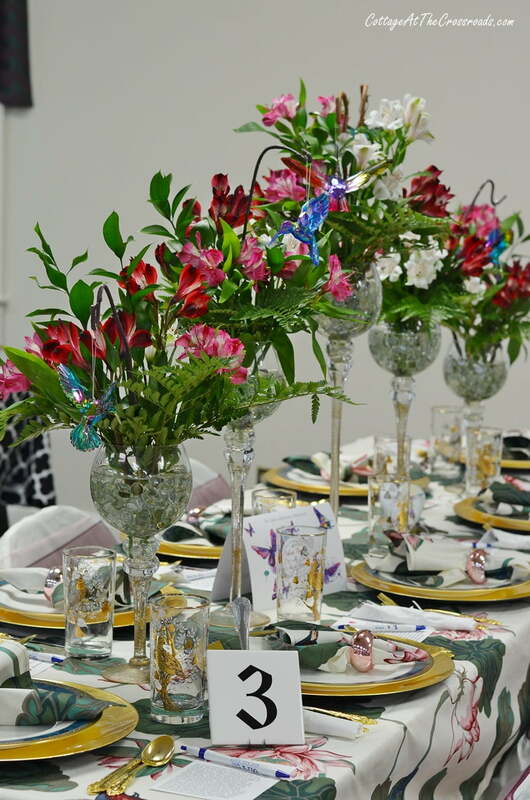 The tall glass candle holders that were used as floral containers were impactful on this table. 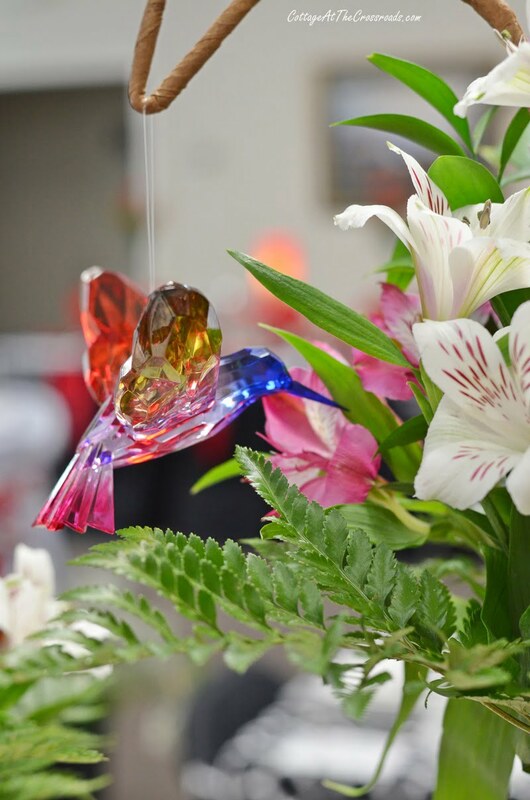 Each floral container held a beautiful glass hummingbird, making each one look like it was about to take a sip of nectar! I did not get the story on the beautiful glassware on this table but doesn’t it fit perfectly? 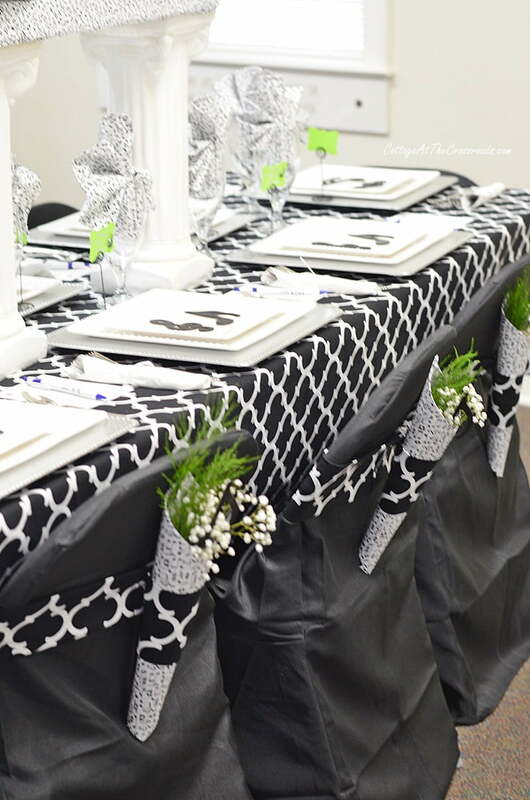 Table 4 had a music theme and a black, white, and green color scheme. 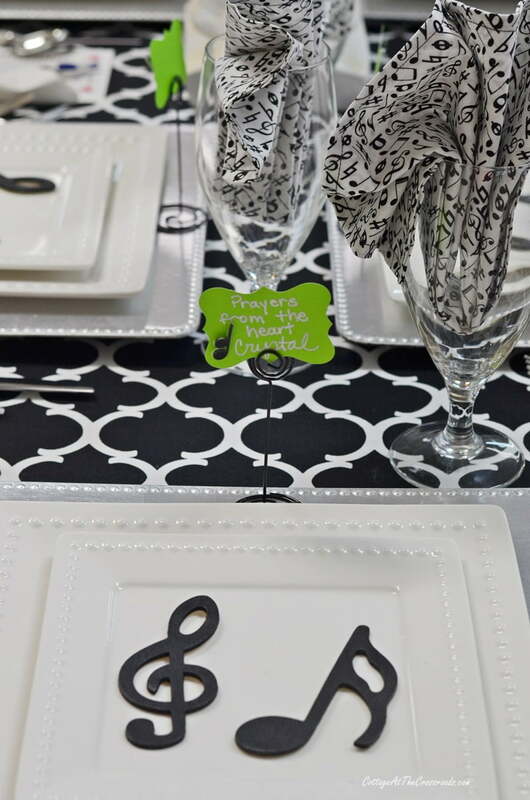 Musical notes were at each place setting and on the napkins. 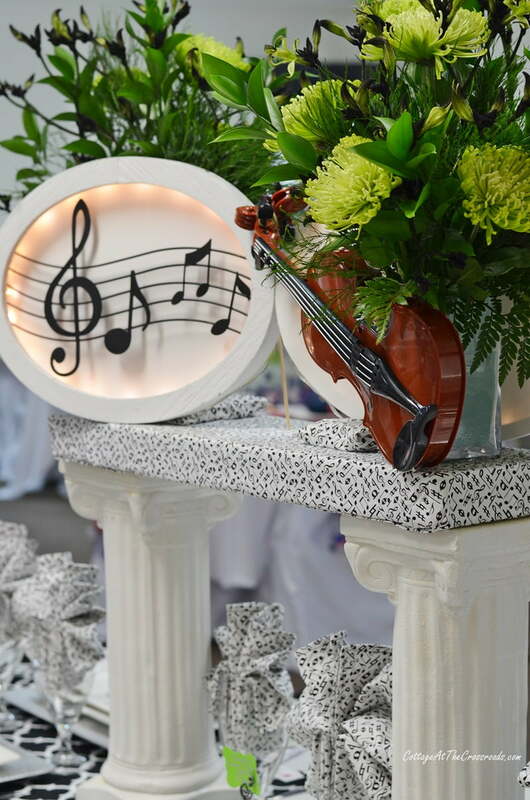 The centerpiece was elevated on classical columns, lighted, and even played music! 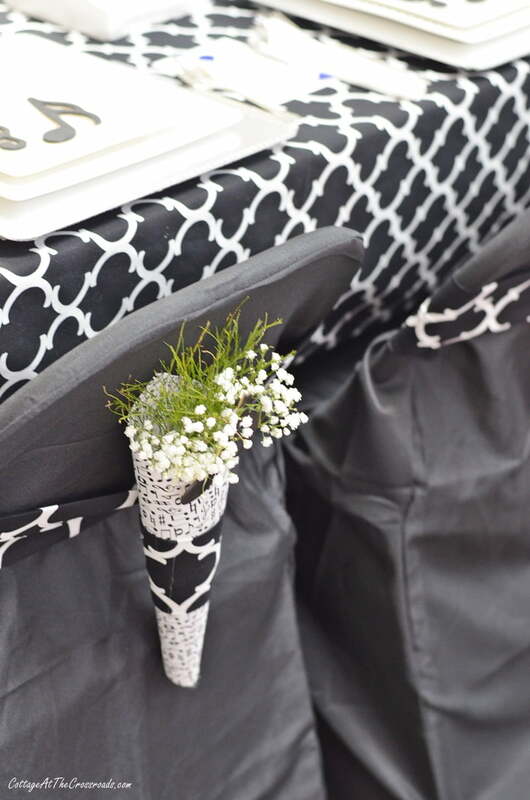 Here’s a closeup of those tussie mussies filled with baby’s breath that were attached to each chair cover. Table 5 was a beautiful Valentine’s Day table. 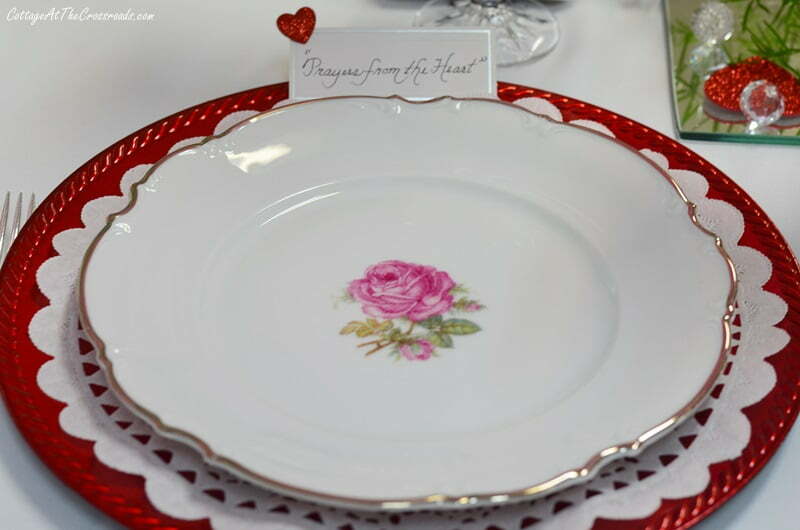 Each place setting featured these beautiful vintage dishes that had a pink rose in the center. They were inherited from an aunt. 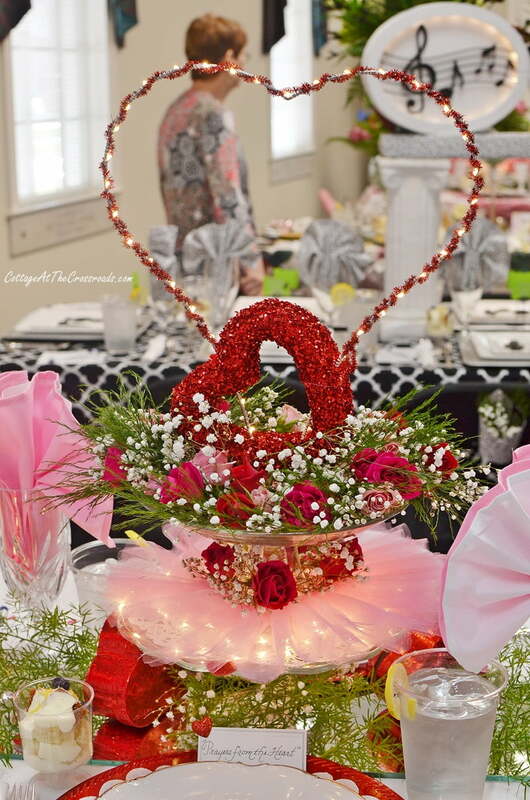 The lighted floral centerpiece featured beautiful pink and red roses and carried out the Valentine’s Day theme. 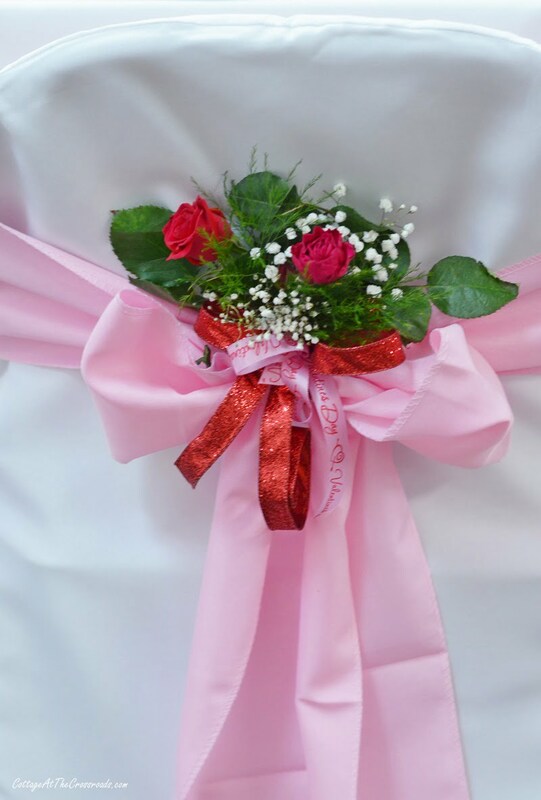 And look at the beautiful floral decoration on the pink sashes on the back of each chair cover! 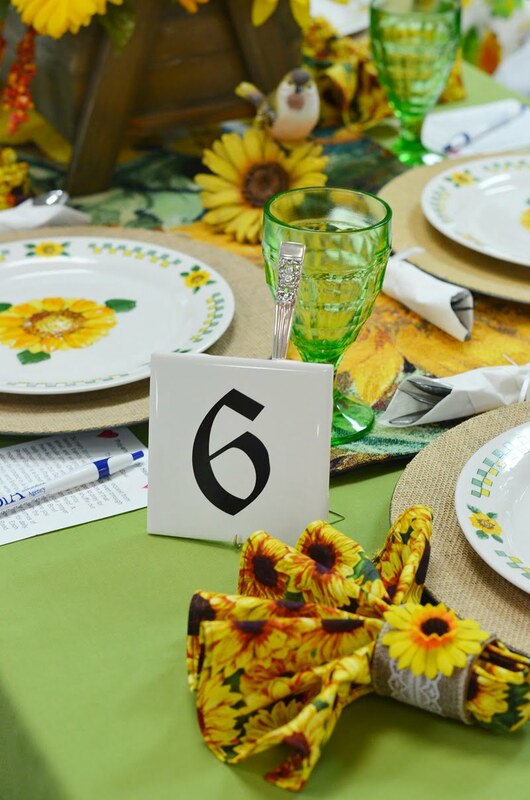 Table 6 had a sunflower theme with beautiful shades of green, yellow, and gold. 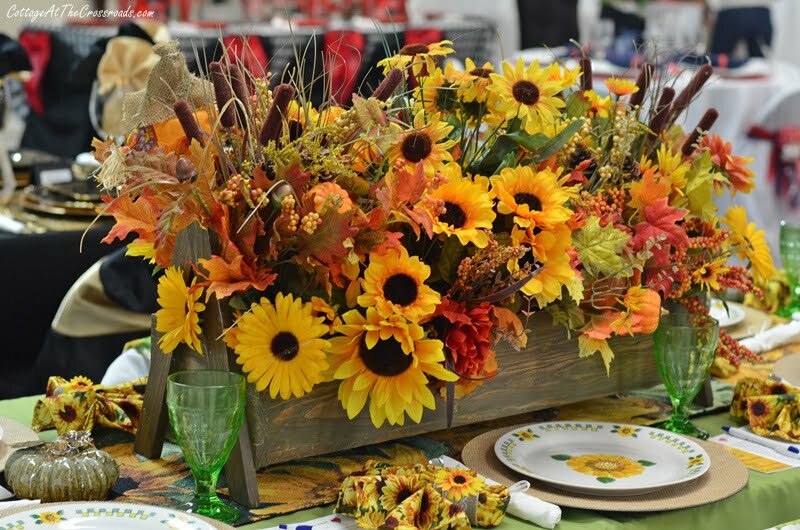 Each plate contained happy sunflowers and fall elements filled the wooden centerpiece. The pretty green stemware pairs perfectly with the colors used on the table. 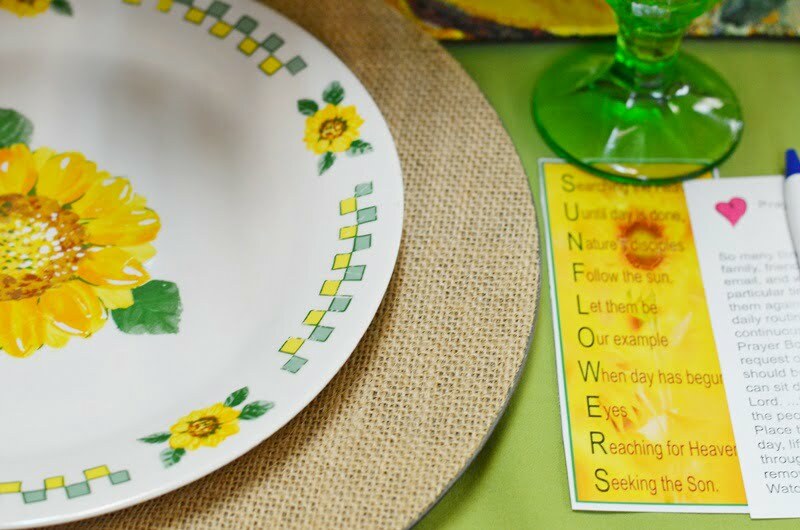 These sunflower bookmarks were at each setting with a beautiful and meaningful saying on them. 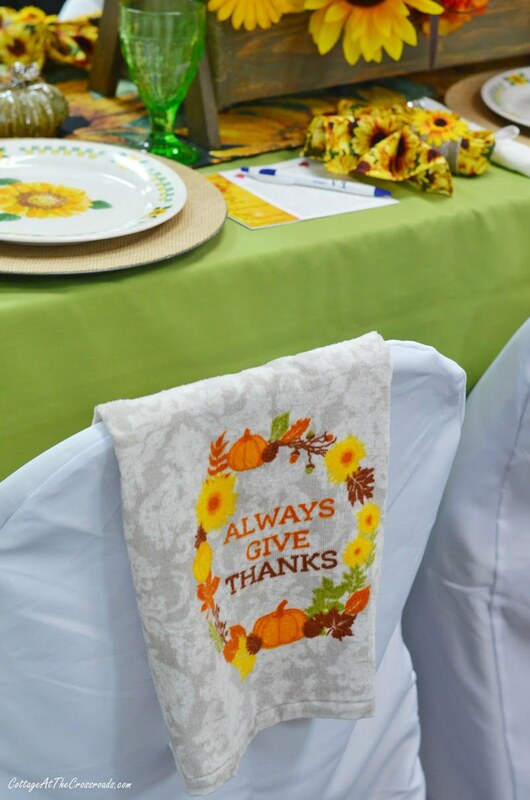 Each chair cover was decorated with a different autumnal tea towel that complimented the theme. 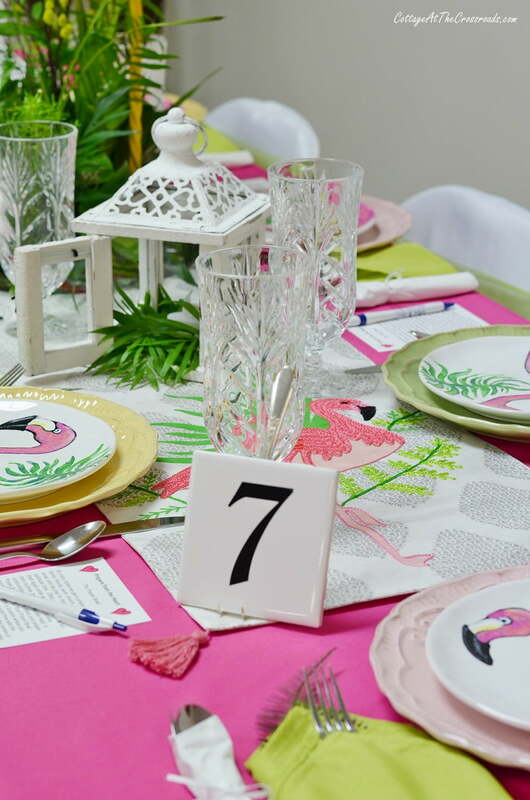 We had another flamingo themed table for Table 7! 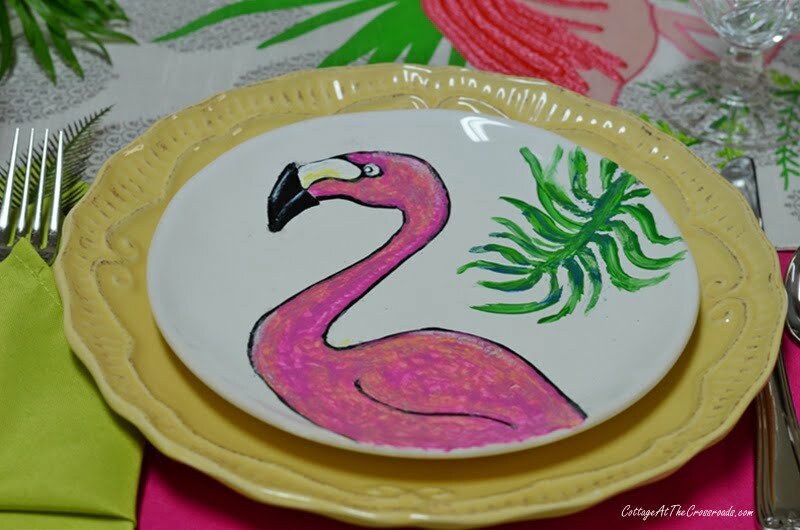 Each setting featured these hand painted flamingo plates. Down the center of the table was this gorgeous embroidered table runner. 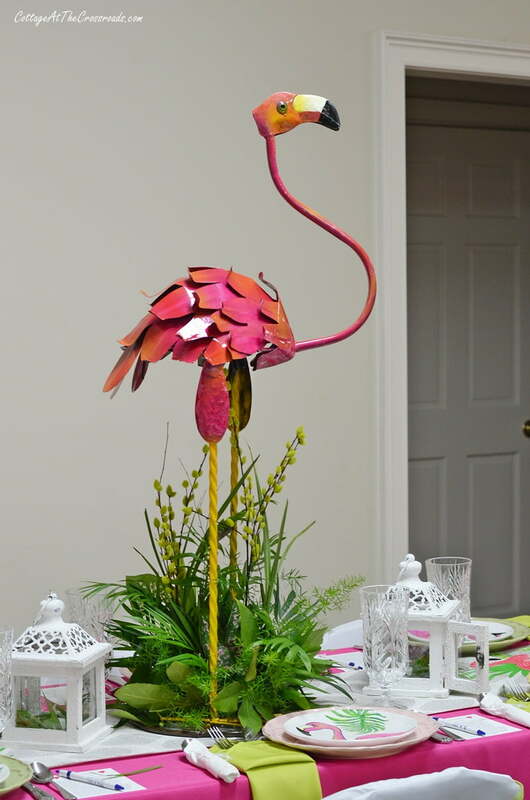 This tall metal flamingo made a great centerpiece for this fun table. 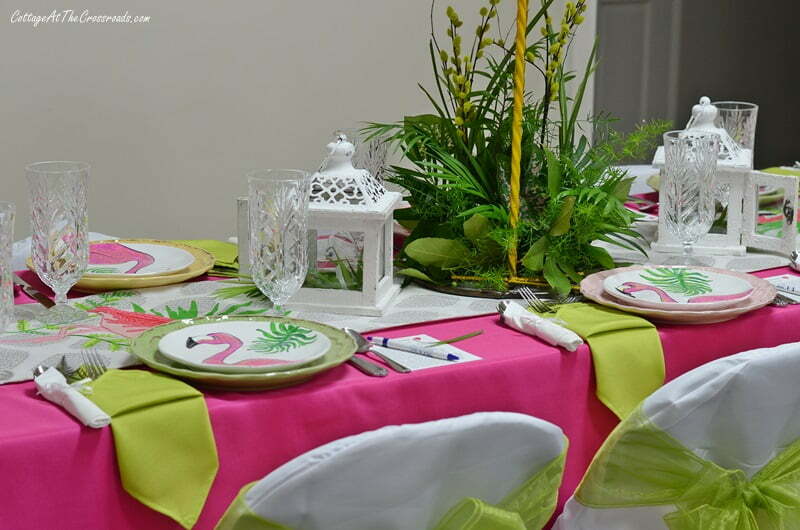 Bright green sashes and napkins completed the tropical theme. 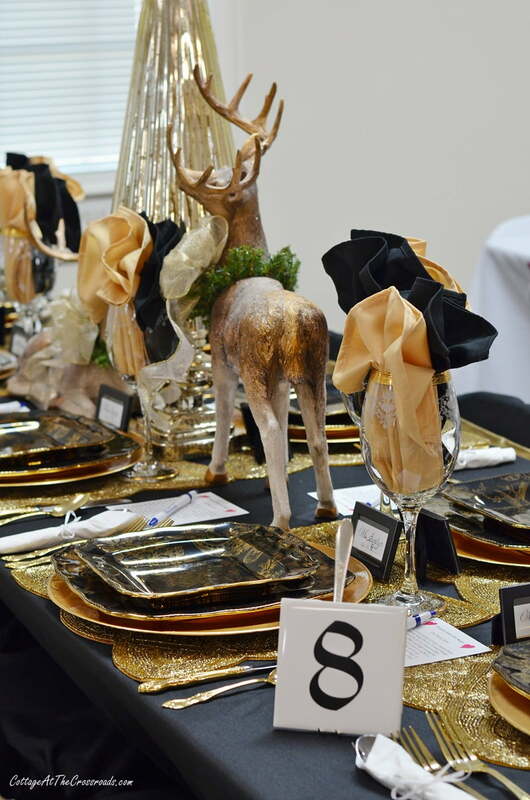 The last table for today is Table 8 which was an elegant black and gold Christmas table. 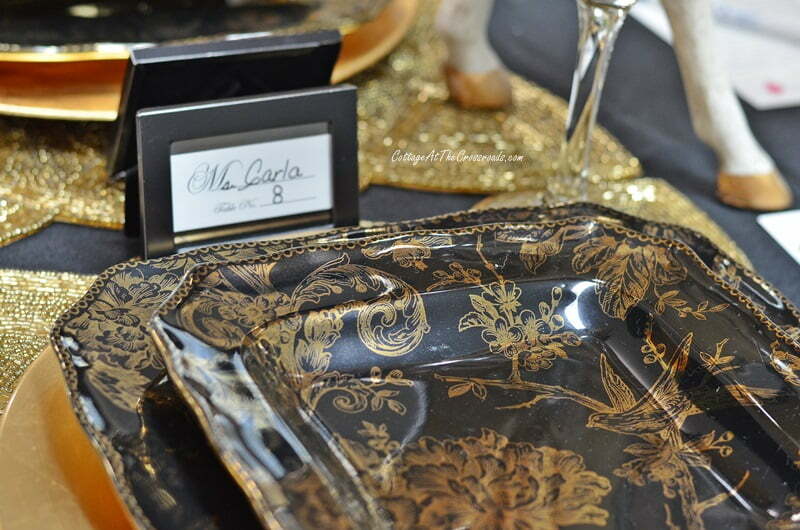 The beautiful design of the china was paired with gold chargers and placemats. 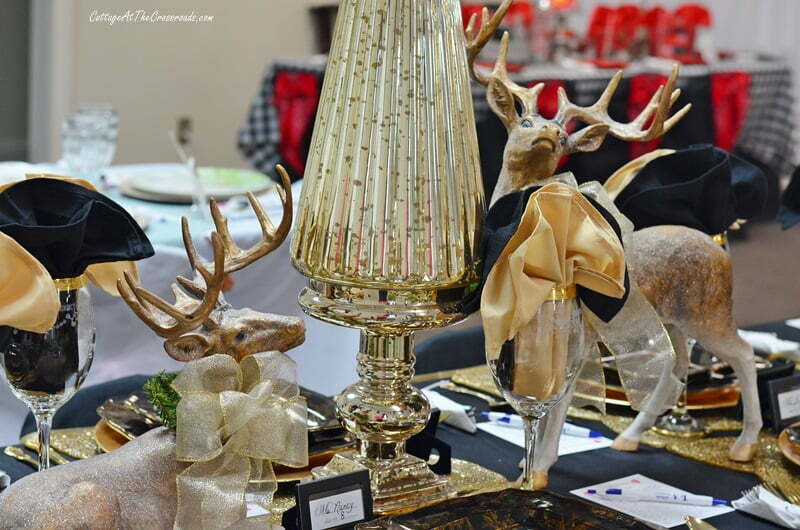 Beautiful reindeer were situated beside a striking gold mercury glass centerpiece. 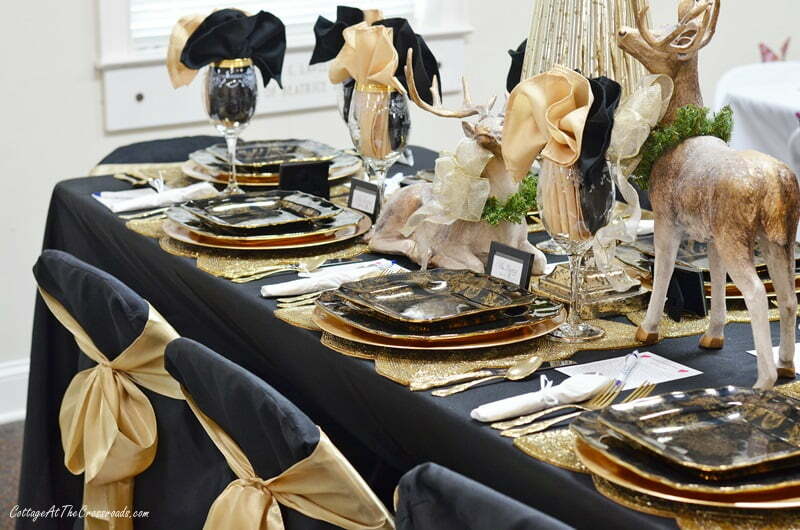 Simple gold sashes dressed the black chair covers. I’ll be back soon to show you the rest of the tables that were at our tablescape fundraiser. 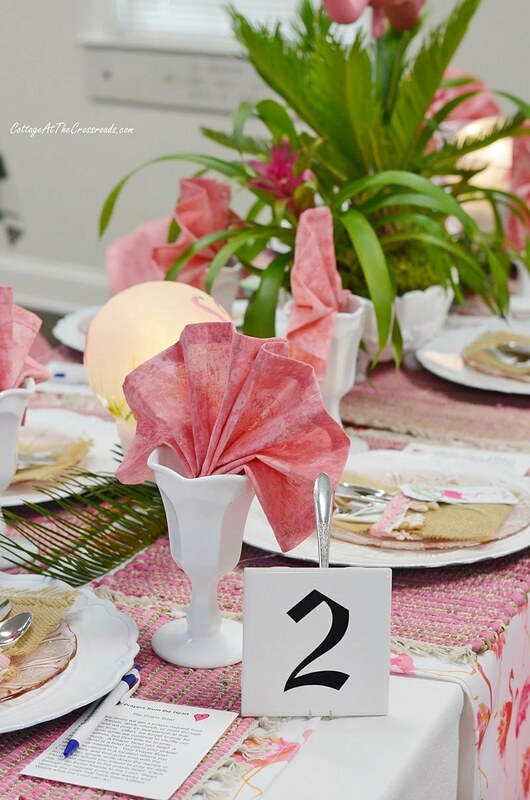 Stay tuned because you don’t want to miss a single one of these creative tables! I love your flamingo table! I think flamingos makes everyone smile! All these tables are beautiful! These table settings are amazing! This is the ultimate girl time, in my eyes. 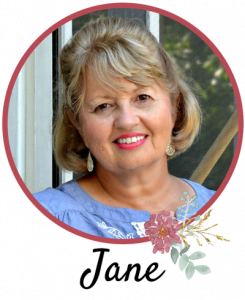 Pretty tables, lots of women, and encouragement for your heart. Sounds like a wonderful time. 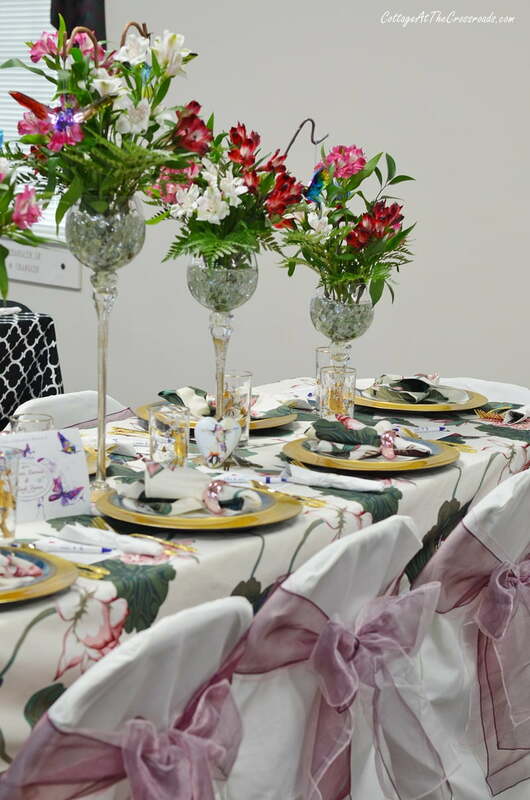 Yes, it’s such a fun and inspiration event, and I end up wanting everyone’s china! Beautiful tables – I think I favor #8! Looks like it was a wonderful event! Wow. Each table is just fantastic! Lots of creativity and hard work is evident. I like them all and can’t wait to see the rest! You have such talented ladies at your church! The tables are all gorgeous. I love this idea for a ladies event. I will have to pass it along to our Ladies’ Ministry leader. The tables are all beautiful and the hard work is certainly evident. Look forward to part 2. Beautiful, beautiful tables!!! 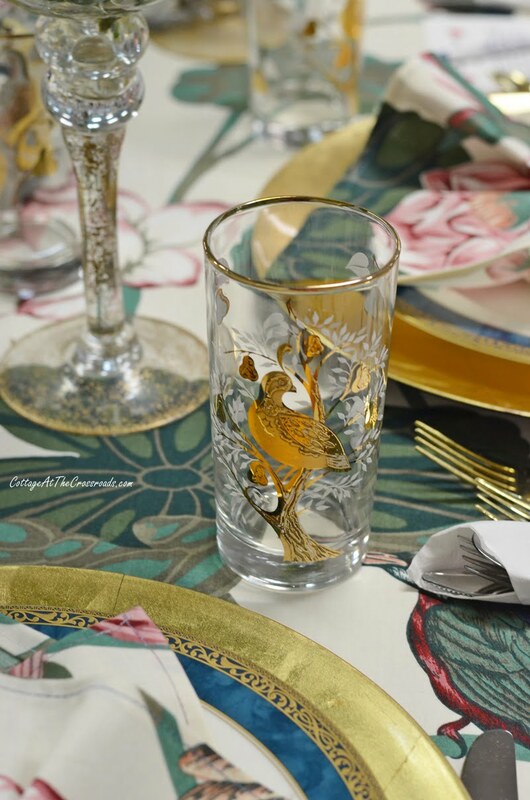 !…I so love the fun Flamingo table…and if you ever find out where the glasses that has the design of the gold partridge I would love to know!!! What a great fundraiser!! Love all the tables! Your flamingo table is my favorite so far!! Can’t wait for the next post. Hope you and Leo are faring well with all these hurricanes! Take Care!